The Latke Festival, a celebration of the potato pancake and one of the year’s tastiest holiday events, returns to the Brooklyn Museum for a second year Monday, December 18 from 6 to 9 p.m.
Benefitting The Sylvia Center’s important work teaching children and their families how to cook and eat healthfully, The 9th Annual Latke Festival will showcase creative interpretations of latkes by some 20-plus chefs from Brooklyn, Manhattan and beyond. They will compete for “best in show” status from a panel of judges, as well as for the favorite pancake according to attendees’ taste buds. Last year, Chef Saul Bolton of The Norm restaurant brought in Caribbean flavor with an oxtail-topped latke made from yuca and finished with a coconut milk yogurt on top. 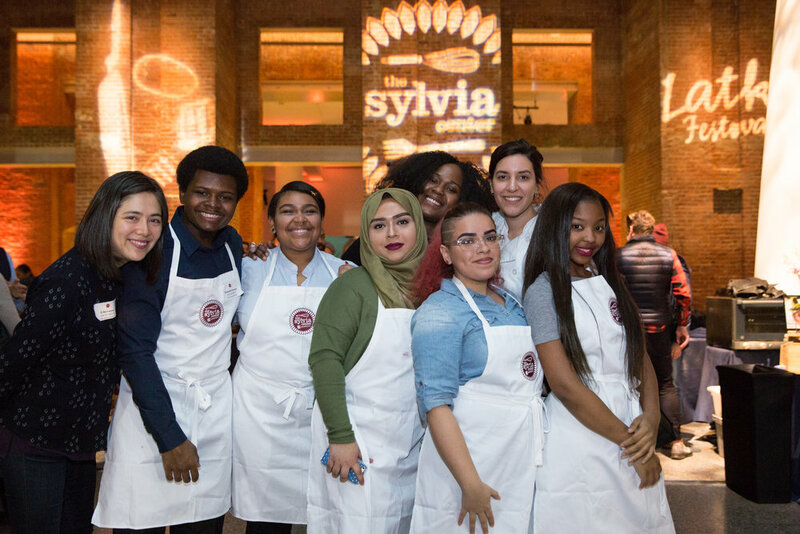 What will Chef Saul and participants fry up this year? Participating restaurants will include last year’s Judges’ Choice and People’s Choice winners, Benchmark and Shelsky’s of Brooklyn, along with Burger & Lobster, Kulushkat, The Norm at Brooklyn Museum, Korzo, Veselka and more. Tickets are available now; don’t miss what TIME OUT New York call one of the” most amazing things to do in December” - a jolly celebration of one of the best holiday foods! Get excited with Saul's recipe from last year. 1) Parboil yuca then cool down for 30 min. Grate on large holes of a hand held grater. 2) Place yuca in bowl, then squeeze the juice from the onions in towel into the bowl. 3) Mix well and season with salt and pepper. 4) Form ¼ cup size balls of the mixture into patties. 5) Fry the patties in a nonstick pan until golden on both sides. Drain on paper towels. 1) Season pieces of oxtail with salt and pepper. Place on a cookie tray and cook in a oven preheated to 400F. Brown the oxtail in the oven. Remove and discard rendered fat. 2) In a large casserole brown the onions, carrots, garlic and peppers. Add thyme, allspice, black pepper, and a pinch of salt. Cook for 5 minutes. Add red wine and cook for 5 more minutes. Add the oxtail to the casserole. Add enough beef stock to barley cover the oxtails. Add the browning. Cook the oxtail half covered until tender. 3) Remove oxtail and take the meat off the bone. 4) Add the oxtail back to the pot and cook the mixture over a low heat until sticky and sweet. Season to taste. Top the warm latkes with 2T of warm oxtail mixture, top that with coconut yogurt. Finish with a sprig of cilantro and serve.